A native of Council Bluffs, Iowa, Michael Wesley grew up a Mississippi State fan despite living over 800 miles from the Magnolia State. His parents, originally from Mississippi and Alabama, went to MSU and the Mississippi University for Women. Because of the strong family ties that linked him to Mississippi State, Wesley attended the university and majored in agronomy with a concentration in integrated pest management. 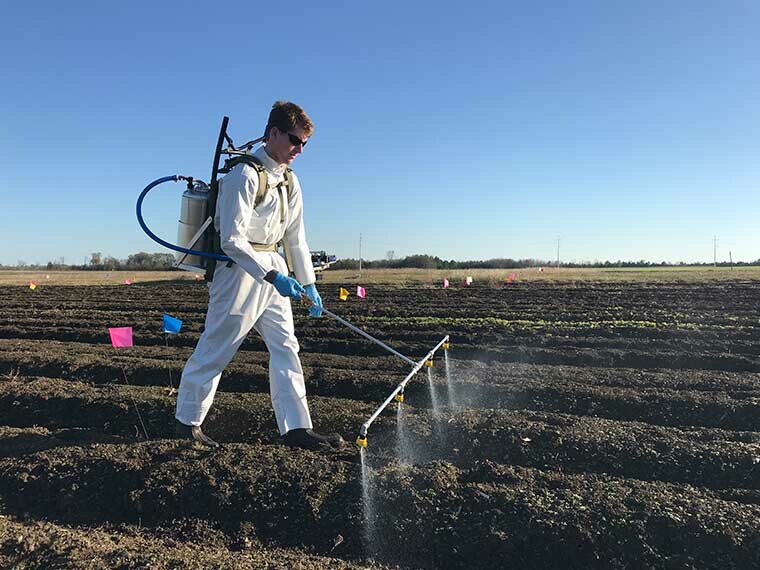 Wesley along with Luke Merritt, Zachary Treadway, Kayla Broster, and Pedro Ferreira make up the master’s students under the direction of Dr. Connor Ferguson, assistant professor in the Department of Plant and Soil Sciences. Wesley is currently involved in three separate studies focused on Italian ryegrass control in corn. One study tests spray droplet size effects on Italian ryegrass, looking at various droplet sizes of three spray nozzles: TT, AIXR, and the TTI. Another study is testing the effects of herbicide active ingredients by examining the active ingredients in twelve residual herbicides that are sprayed in the fall. The final study tests the effects of Italian ryegrass removal timing in relation to corn planting. In that study, Italian ryegrass removal beginning at 90 days before planting, up to 28 days after planting was studied to understand the impact of each week that Italian ryegrass affects corn yield, even before planting. Glyphosate, more commonly known by the brand name Roundup, once provided excellent control of Italian ryegrass; however, the weed has shown resistance to the herbicide for nearly 15 years. Italian ryegrass resistance to glyphosate is most prevalent in the Mississippi Delta. “Glyphosate is used heavily every year because it is such a dependable herbicide. However, continually relying on any herbicide, over time, can result in weeds surviving herbicide applications. As more weeds from a population survive after each ensuing application, you can end up with a weed population that is completely resistant to that herbicide. In effect, it really limits the herbicides that you can spray, so identifying alternative options is really important,” Wesley said. Wesley said another herbicide called clethodim, commonly known as Select Max, is also used to control Italian ryegrass. Nevertheless, traces of resistance to that compound have also been found in the Delta. Wesley hopes to find more preventative measures in controlling the weed, including using herbicides sprayed in the fall months, between October and November, before Italian ryegrass has the opportunity to grow. Wesley and his fellow graduate students are still in the process of researching Italian ryegrass, but he hopes that by the time he finishes the program, he will contribute to solving a current problem associated with controlling Italian ryegrass in corn. This research is supported by the Mississippi Corn Promotion Board.